16 gauge, 4 wire Speaker Cable, Plenum CL2 UL, 500ft in a sturdy pull box. 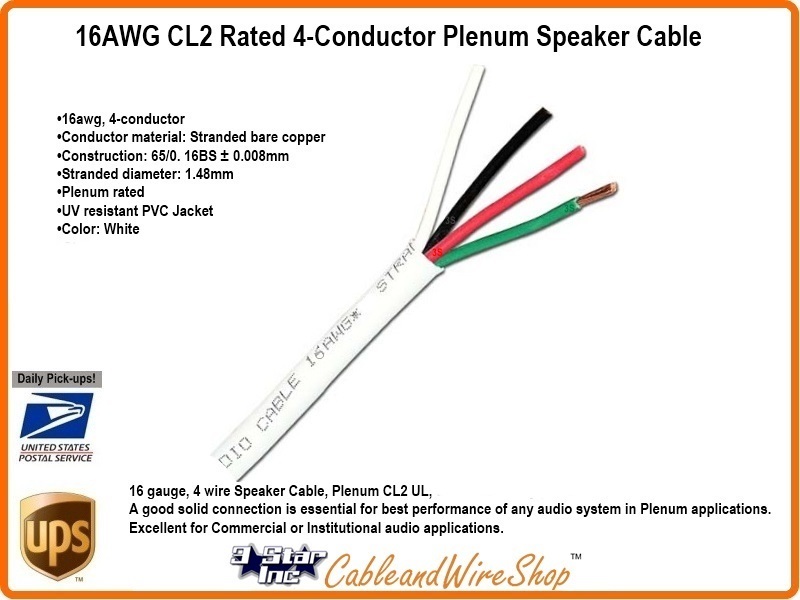 A good solid connection is essential for best performance of any audio system in Plenum applications. Excellent for Commercial or Institutional audio applications. If you're setting up on a speaker system or upgrading your current installation, Cable & Wire Shop has the bulk speaker cables you need. Available in 500' foot boxes, choose between 2 and 4 conductor wire in addition to plenum, direct burial or oxygen-free cable. Don't miss out on our banana plug speaker connectors to complete your next big project. Most cables and accessories are in stock and ready to ship today. If you have any questions, please contact Cable & Wire Shop at 1-877-660-0974.